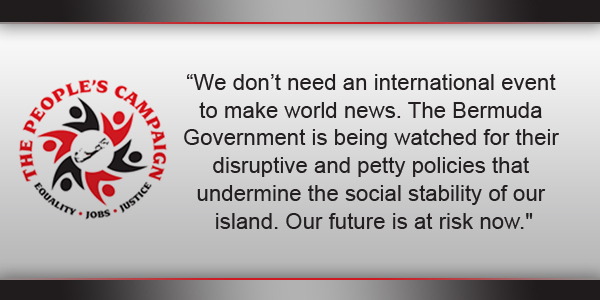 “We don’t need an international event to make world news” as the “Government is being watched for their disruptive and petty policies that undermine the social stability of our island,” the People’s Campaign said. “The world is not only watching what is happening regarding the America’s Cup but also how this Government is responding to those who disagree with them or are vocal in their opposition to their government policies. “It is shocking that in 2017, years after the bigoted and biased practices of the 50′s and 60′s that the country is once again being subjected to bully tactics to remove one man who has dared to speak out about injustices and speak up for the rights of the people. “We don’t need an international event to make world news. The Bermuda Government is being watched for their disruptive and petty policies that undermine the social stability of our island. Our future is at risk now. “The message that this Government is sending will have detrimental effects on the lives of our young people, who are watching closely as one individual —Reverend Nicholas Tweed, is being targeted and forced to leave his ancestral home. “How can this Government call on everyone to support the America’s Cup but in the same breath try to demonize and destroy one man for speaking up for the rights of Bermudians. It is hypocrisy at the highest level. “But then again, this is the same Government that has made substantial concessions and work permit waivers for numerous companies and hotel and casino developers. “The Premier’s message ‘We will not be bullied, threatened or intimidated’ has hit its intended target, the people of Bermuda have heard you loudly. We understand clearly that their narrative is that the OBA Government does the bullying, does the threatening and is bent on intimidating anyone who opposes their policies. ‘One set of rules for everyone’? We’ve yet to see that since the OBA became Government. It has been more of the rules that apply when it suits their caucus. One set of rules for those who agree and speak favorably of this Government another set of rules if you don’t.